The U.S. Supreme Court opens its new term on Monday with several cases set for argument and others waiting in the wings. 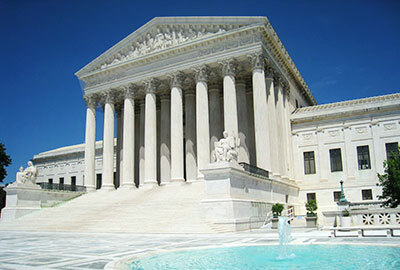 The high court’s docket for the term is by no means set, and the justices are likely to consider, among others, controversial cases involving abortion rights, immigration and religious freedom exemptions from contraceptive coverage under the Affordable Care Act. Here are a few of the noteworthy cases the high court has already agreed to hear. Who should states count when tabulating populations for redistricting purposes? That’s the question presented in Evenwel v. Abbott, a case that’s as much about state’s rights as it is about voting rights. In 1964, the U.S. Supreme Court rejected an Alabama redistricting plan which allotted just one representative to heavily-populated and sparsely-populated districts alike, ruling in Reynolds v. Sims that under the “one person, one vote” concept of equal representation, legislative districts should have roughly equal populations. The high court has not, however, dictated how states should count population for purposes of drawing state legislative districts. Typically states have counted the total population, giving all people equal representation. Voters in rural Texas have challenged that process in Evenwel, contending that by including non-eligible voters – those who aren’t citizens, for example, or those who’ve been in prison – in a district’s total population, the state gives greater weight to the far fewer votes that would be cast in such districts. They argue that instead each vote should be equal and that population count should be based on eligible voters only. Many voting law experts predict that should the high court adopt the Texas position, a shift in political power from urban diverse areas to suburban and rural ones would follow. The court will once again review admissions policies at the University of Texas at Austin in Fisher v. University of Texas at Austin, a case with implications for the lawsuit pending here challenging admissions policies at UNC-Chapel Hill. The justices first reviewed the case filed by Abigail Fisher, a white student denied admission to the University of Texas at Austin allegedly because of her race, in 2012. In a 7-1 decision the following spring, the justices sent the case back to the 5th U.S. Circuit Court of Appeals for further review. After a second look, the appeals court again upheld the university’s admissions policies in July 2014, finding that they withstood the strict scrutiny test for judging race-based policies. How the high court rules this second go-round in Fisher will likely impact the UNC case, since challengers there as in the Texas case contend that the university admissions policies at issue cannot survive “strict scrutiny.” In the UNC lawsuit, filed under the name “Students for Fair Admissions Inc.,” attorneys for plaintiffs — selected after a nationwide search by backers of Project for Fair Representation — argue that diversity at the schools can be achieved by race-neutral alternatives and that public colleges and others receiving federal funds should be ordered to end the use of race in admissions altogether. Three cases that concern an individual’s ability to get his case heard by a court have landed on the Supreme Court’s docket so far this term – two concerning class actions and another involving claims of statutory violations that might not necessarily have resulted in damages. The high court only recently stepped into the class action foray after years of allowing procedural law in that area to develop in the lower courts. In 2011, the court rejected a class of more than a million female Wal-Mart employees claiming pay discrimination, with a majority of the justices finding in Wal-Mart Stores Inc. v. Dukes that the women had distinct and different employment experiences and thus lacked the commonality need to proceed as a class. That same year the court also upheld class action waivers in consumer contracts in AT&T Mobility LLC v. Concepcion, making it easier for companies to limit consumer class actions through arbitration agreements. Tyson Foods, Inc. v. Bouaphakeo, set for argument on November 10, tests the limits of statistical evidence used to prove common damages in large class actions, a method the high court considered in Wal-Mart v. Dukes. Some 3,000 hourly workers at an Iowa pork processing plant sued Tyson Foods, alleging that the company failed to pay them for time spent “donning and doffing” protective equipment and walking to and from the job floor. The district court certified the workers as a class based upon the common question of whether those activities constituted compensable work, despite differences in the amount of time workers spent on these tasks, and allowed the workers to prove their case with statistical evidence of the time an average employee would spend donning and doffing — gleaned from their expert’s filming and timing of workers doing just that. Tyson Foods is challenging the use of that statistical evidence, saying the court’s decision in Wal-Mart limits its use. What happens when a company in a class action lawsuit offers the named plaintiff complete relief before a class is certified? If the plaintiff’s claim is mooted by such an offer – regardless of whether the offer is accepted — can the class action proceed? That’s the question in Campbell-Ewald Company v. Gomez, set for argument on October 14. In the case, the company – sued for sending unsolicited text messages to nearly 100,000 people – attempted to pick off the named plaintiff, Jose Gomez, by offering him full settlement before the court certified the class and allowed it move forward with the lawsuit. Gomez refused the offer, but the company claimed that with their offer he had no injury to complain about and the case was thus mooted. Trying to get the first-named plaintiffs in a class action to settle early has long been a defense tactic. For that reason, attorneys bringing such a case often try to name several individuals as plaintiffs, but even that doesn’t ensure that the case can proceed in the face of settlement offers. Advocates of class actions have longed promoted them as necessary avenues of relief for large numbers of consumers for whom individual lawsuits would be cost prohibitive. Allowing the defendant companies to pick off plaintiffs and short cut such cases would severely limit their viability as a tool for consumer relief. Spokeo, Inc. v. Robins, set for argument on November 2, raises the question whether an individual can sue a company for a statutory violation even if that individual has suffered no harm. In the case Robins discovered that the information-gathering company Spokeo had listed several inaccurate details – employment status, education, age — in its online profile of him. Robins sued the company for violations of the Fair Credit Reporting Act, a federal law that allows individuals to seek actual damages or, in the alternative, statutory damages. The company argues though that Robins suffered no actual harm and thus no constitutional standing to bring his case.